Magnificent results by Resonites in NTSE Stage 1, Maharashtra. The Managing Director of Resonance, Mr. RK Verma informed that in this year there has been an enhancement of the number of scholarships from 1000 to 2000 in NTSE. In the declared result of NTSE Stage-1, total 775 students are selected for the stage-2 examination & out of them 37 students are from Resonance. 26 students are from regular classroom Programme, 7 students are from Workshop & 4 students are from DLPD. 100% result has been attained by Chandrapur Study centre of Resonance. Only two students were selected from this entire district namely RAGHAVRAJ V KALAI SELVAN & SHREYA DEVANAND NIKUMBE. Both of them prepared for the exam at Resonance. In OBC category 2 students have secured State Rank under top 30 (11 & 29). In SC category 3 students have secured State Rank under top 30 (9, 16 & 25). In ST category 3 students have secured State Rank (9th, 11th & 13th). This year, in Maharashtra state, NTSE Stage-1 examination was conducted on 4th November 2018 and the revised result was declared on 20th March 2019 by State Council of Examination, Pune, Maharashtra. This year the cut off of NTSE stage-1 was 174.28 marks in General Category, 167.96 marks in OBC Category, 154.61 Marks in SC category & 141.89 marks in ST Category respectively. However, The National Talent Search Examination is merit based scholarship examination for class 10th students. It is conducted in two stages. It is one of the most prestigious scholarship examinations in India. NTSE examination can be taken by Indian students as well as Indian students studying in abroad. 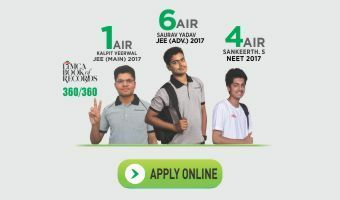 Around 8000 students get selected for the second round from all over India. Out of these, 2000 students will be selected for final scholarship of Rs. 1250/-per month which will be provided to them till class-12 and afterwards they will get Rs 2000/- per month to complete their education. Resonance wishes Heartiest Congratulations to all the selected students and wishes them all the best for NTSE Stage-2. This year NTSE Stage-2 exam will take place on 16th May 2019 in every state headquarters.